Sales scripts put sellers inside a box and lock them into selling a certain way, but when you throw away your sales script and do more creative, engaging selling, you’ll increase your conversion. 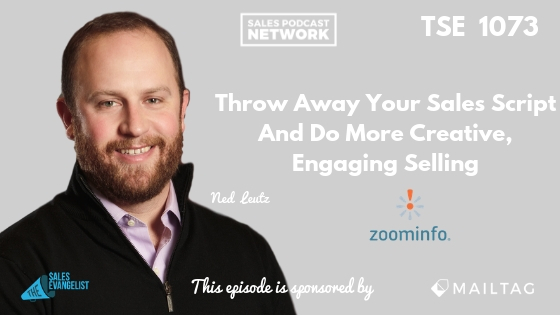 Ned Leutz runs two teams for ZoomInfo, a business data and technology company that helps salespeople get in touch faster and drive more meetings and more sales. 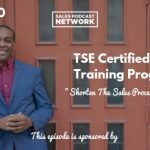 He’ll talk today about throwing away the script in your sales efforts to increase your flexibility and your success. People are accustomed to getting fast answers without ever having to engage with a person. By the time the prospect makes contact, the salesperson with a script may prove to be less flexible than the Internet. When that’s the case, there’s really no need for a salesperson. Ned believes that giving a salesperson a script is the “kiss of death” and that scripts don’t drive conversion or sales. Salespeople who are limited by scripts will often fail to connect with the prospect’s problem. If the goal is to find mutual challenges that you can solve together, the script will be extremely inefficient. Instead of operating from a script, Ned suggests providing a map to sales reps. He believes in setting an agenda with the main goal of finding a point of mutual connection. 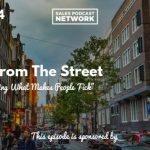 Ned’s team starts with the question, “Why did you decide to take my call?” He says that most people don’t take a call with a salesperson unless they have a suspicion that the salesperson can solve a need. About 90 percent of the time, the prospect faces a challenge that he needs help with. The other 10 percent might be a case of someone taking your call because you’re just a nice person. In those cases, you’ll have to work to qualify the prospect before moving forward. The question seeks to discover what caught the prospect’s attention and prompted him to accept the phone call. It eliminates half of the guessing. Begin from a point of mutual agreement. Either there’s a problem that you can solve or there isn’t. Once you’ve set that agenda, you’ve established an expectation for the conversation. You’ve earned the right to discover whether or not there’s a problem you can solve. You can ask the key questions of your customer to identify the challenge. The alternative is to play a sales version of whack-a-mole in which you’re constantly asking, “Is this it?” “Is this it?” You’ll bore the client who will much prefer to research on his own since he’ll likely perceive that you aren’t listening or guiding him. Nobody is taking your B2B sales call without looking at your website first and deciding whether there is something there that catches their attention. You can assume that the prospect has done some research before accepting your call. Ned wants sellers to throw away the script in cold calling because there’s enough information readily available to sellers that they should have a pretty good story for why they are calling each prospect. When you call a prospect, it’s a suspicion rather than a script. you’ve got a reason for calling. Your customer will have the sense that he isn’t just a number on the list. Ned points out that data companies can’t fix a broken sales process or a bad product. A data company can give your sellers the information they need at their fingertips to have a 90% story as to why they might be able to help a particular company. One of the worst sales questions we ask is, “If you solved this problem, how much money would you make?” Most people have no idea. It’s not important that the prospect be able to quantify it immediately. It’s important that the prospect understand the impact your solution will make. That thinking will help them decide whether it’s worth making an investment. Ned believes that if you can get cooperative collaboration on building a business case, you know that you have a good chance of closing the deal. He points to ineffective activity as the reason many sales teams struggle. Scripts often result in ineffective cold calling, and data can hurt as well. If you spend your day calling switchboard numbers all day but you can’t get a single gate-keeper on the phone, you’ll have a hard time moving forward. Ned’s company engages in proof of concept in which they inject direct phone numbers into an organization’s system and then ask the reps to engage in the same activity they always do. They know the conversations will convert at a much higher rate simply because they’re going to talk to more people live. They’ll set up an experiment in which sellers make 10,000 phone calls across an SDR group without data and then 10,000 with the data and then evaluate the number of live connections and ultimately the number of meetings. The outcome typically results in 10 more meetings a week, which is 520 more meetings a year. Help your prospects arrive at conclusions on their own. Rather than give them answers, allow them to discover the answers themselves. At that moment, you’ve earned permission to share. You’ll earn your customers’ trust very quickly this way. Scripts won’t get you where you need to be. Instead, give your team a framework under which they work to identify the client’s business case and then evaluate whether the expectations are reasonable. If a customer expects to close 20 deals with a product that isn’t transactional and has a long sales process, that isn’t a very reasonable expectation. The sales rep must negotiate that expectation to something more reasonable. It’s tempting to rely on scripts, especially when things aren’t going well. It’s also tempting to wrestle control away from your reps. Instead, invest your energy into building a map and providing constant reminders around asking good questions. You will close deals with a script, but you’ll close them at a lower dollar amount at a much slower frequency. Instead of measuring the number of calls you made, measure the number of outcomes. If your number of calls falls, but the number of meetings increases, forget about the number of calls. You can connect with Ned Leutz on LinkedIn or email him at Ned.Leutz@zoominfo.com.